“Inside North Korea,” produced by National Geographic in 2006, provides a disturbing glimpse into the dictatorship of Kim Jong-il. The documentary follows a humanitarian medical team that was admitted into the country to provide over 1,000 cataract surgeries in less than 10 days. Government “minders” watched and regulated their every step. As you can imagine, the making of the documentary was no easy task. Photographing and filming anything other than what was officially sanctioned was a dangerous game of hide and seek. What a difference from free societies where just about everyone has a camera built into their cell phone. The speed and ease with which footage can be uploaded to websites like YouTube, Flickr and Facebook puts an interesting twist on who the minders are. So it was refreshing to juxtapose “Inside North Korea” with “The President’s Photographer,” another National Geographic documentary produced last year. Narrated by Morgan Freeman, we come to learn of the common denominator between Presidents Obama and Reagan — Pete Souza, the official White House photographer. With a workspace less than 100 steps from the Oval Office and a reserved seat on Air Force One, Souza has constant access to President Obama’s comings and goings. “I am so lucky to be doing this… but it’s a grind,” explains Souza. The responsibility of documenting the history of Obama’s presidency means 13 hour days and an endless stream of digital photos. Souza and his staff create about 8,000 to 20,000 images every week. As many as five percent of the images are handshake photos taken at meet-and-greets that are given to White House visitors and guests as mementos. By the time Obama was 16 months into his term, nearly a million photos were made. Every single one of those images gets examined by the White House photo editor. The best images are selected, and a portion of them are uploaded to the White House website for access by the public. The photos are also enlarged and framed for exhibition in the West Wing, which gets refreshed with new “Jumbos” every two weeks. “I would say [the] changing of the pictures is one of the biggest events that happens around here that everybody loves,” says Robert Gibbs, Press Secretary. One photo, however, remained on display for about a year and half. 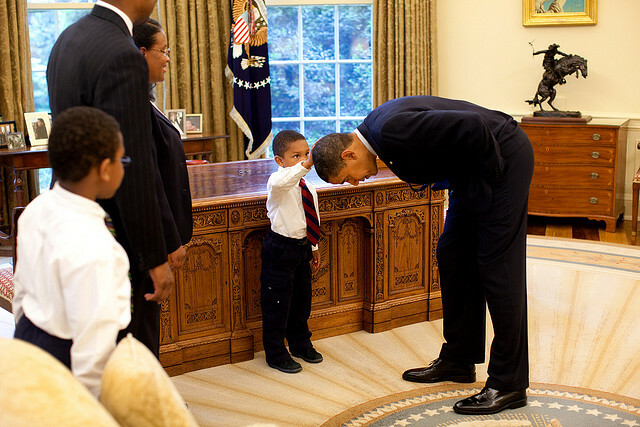 The young son of a staffer had been told that he had the same haircut as the President. The child wanted to see if that was true, so the President obligingly lowered his head for examination. After the little boy pointed out the number of gray hairs, the President explains how the child patted him on the head “to get a feel for it.” Can you imagine that scene ever getting played out with Kim Jong-il? Despite the vast number of digital photos from which to select, all of them become part of the National Archives by law, and none can be deleted from the collection. It must be daunting for Souza and his other staff photographers to know that – unlike the rest of us – they can’t simply press the Delete button for any bad shots that will be permanently associated with them. Given the expertise of these photographers, though, I’m sure that the number of “bad” shots are few indeed. It was President Lyndon Johnson (1963-69) who had the foresight to establish the precedence of hiring a White House photographer. In the internet age, we have easy access to the sitting President’s photos without having to visit the National Archives. This month, Obama starts the second half of his presidency. And the new edition of the House of Representatives is Republican controlled. So it will be interesting to visit the White House website periodically to see how the photography staff documents the next two years in our nation’s history – each day features a new photo. It’s a privilege that, unfortunately, is unknown to the people of North Korea and those oppressed by dictatorships elsewhere.